There are 1 cat videos tagged with anteater. Save the Sloths! 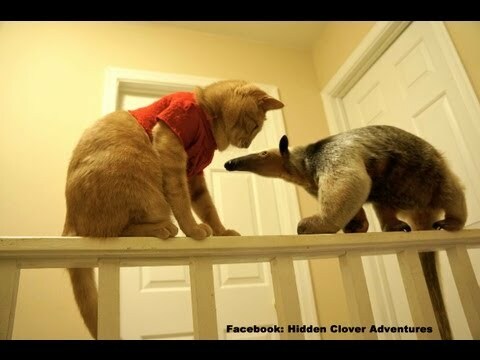 Love, An Anteater. Hidden Clover is helping children of all ages fall in love with nature through Children’s Books, School Events, and Conservation. Our books take children through adventures with games and facts that teach about nature. Our school events use live animals combined with stories and pictures to make nature education an experience. Our conservation work is focused on endangered species preservation. Hidden Clover is USDA certified for the ownership and exhibiting of animals. All of our animals were born domestically to USDA breeders. Our animals are not pets, but rather educational animals that receive extensive care that allows them to be comfortable around children. We do not promote exotic pet ownership. Our hope is that the unique experiences we provide will encourage others to preserve nature.